For a long time now, I've been a fan of everything that Pharrell Williams does. I've had the pleasure to meet him and his wife, Helen Lasichanh, and they are incredibly kind people with a knack for design, art, fashion and beautiful things. Pharrell is a musical genius and a creative monster so it was only natural that his long term friend, Emmanuel Perrotin, had invited him to curate GIRL, the inaugural show of Galerie Perrotin's new Parisian space in what used to be the ballroom of a former 17th century hotel (hence the name of the space which is Salle de Bal) in Le Marais, a few blocks away from the first gallery space. Two of the pièces de résistance of the show are hanging on the wall. To the left Laurent Grasso's "Studies in the Past" which was designed as the cover for Pharrel's single "Lost Queen" and to the left, Takashi Murakami's piece with Pharrel and Helen's portrait on their wedding day. Another Takashi Murakami piece using Pharrel and Helen's portraits superimposed on top of his characteristic flowers. Pharrell co-curated the show with Ashok Adiceam, a director of the gallery who graciously walked us through all the levels and rooms of the large space. The original idea was to celebrate the beauty, strength and independence of women and to make it all coincide with the release of Pharrell's latest album G.I.R.L. 32 artists were chosen and approximately half of them are female including Tracey Emin, Sophie Calle, Klara Kristalova, Mickalene Thomas, Taryn Simon, Yoko Ono, Paola Pivi and Cindy Sherman. The room created by The Guerrilla Girls especially for the exhibit. To the feminine component other important pillars were added: pop culture (to account for Pharrell's inspirations and his environment); a bit of Japanese manga and anime channeled through contemporary art (because his aesthetic has always been influenced by Japanese culture) and portraits and sculptures of Pharrell himself. The interplay of these elements not to mention the amount of visual strength and color lends an enormous amount of impetus, vibrancy and optimism to the show. 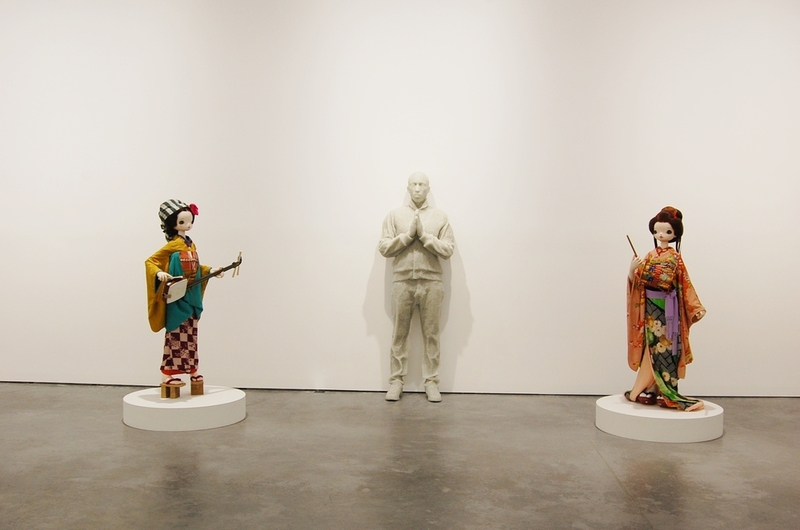 The fact that several artists such as Takashi Murakami, Daniel Arsham and Robert Pruitt opted to work on paintings, sculpture and a " visually biographic" loveseat displaying Pharrell's portrait and sometimes that of his wife was quickly clarified by Ashok who told me that although Pharrell would have never chosen his own image to be in the show, the gallery wanted to honor him that way and commissioned these pieces for the show. The exhibit runs smoothly from the ample spaces on the first floor where a Jean-Michel Othoniel green glass sculpture necklace is hanging from the ceiling to the smaller room beside it where The Guerrilla Girls created a series of works specifically for the show -being this the first time that the collective creates art that is for sale in a gallery-. The floor below continues getting deeper and closer to the theme of the show until we get to the core of it which is the projection room where a 1980 video of Marina Abramović and her former boyfriend and artistic partner, Ulay, called "Rest Energy" shows both of them holding a bow and arrow from each side and looking intensely and intimately at each other in their characteristic performance style. Tracey Emin's neon sculpture "Wanting You"
This show is a visual fete, a moving expression of creativity, a celebration of love and a very accurate representation of the genius of Pharrell Williams in every respect. As such, it's almost impossible to leave the place without feeling uplifted and invigorated, just like anyone would after spending time with Pharrell either on a massive concert or one-on-one with him.